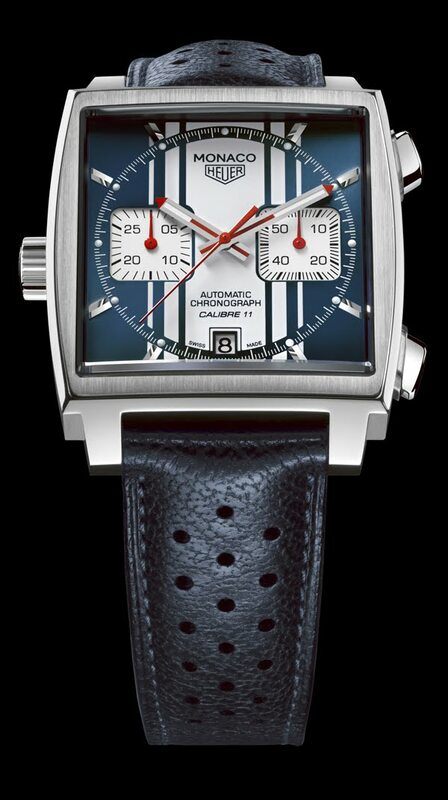 TAG Heuer partners with the Monaco Grand Prix and the Automobile Club de Monaco for the same reasons it is ineluctably linked to the other two “Triple Crown” races of motorsports, the Indy 500 and the 24 hours of Le Mans — because of a wealth of shared values and history. Motor racing and sports timing have been in TAG Heuer’s blood since it invented “Time of Trip”, the world’s first dashboard chronograph in 1911. Today, it calls the winners of the world’s fastest races with an unrivalled precision of 1/10,000th of a second. The role TAG Heuer plays in the prestige and glamour of Monaco is unparalleled in the Swiss watchmaking world. Official Partner of the Automobile Club of Monaco (ACM), the organizer of the Grand Prix, TAG Heuer is also Official Partner of Monaco’s most winning team — Vodafone McLaren Mercedes (15 victories), and sponsor of more first-place Monaco drivers than any brand in history. 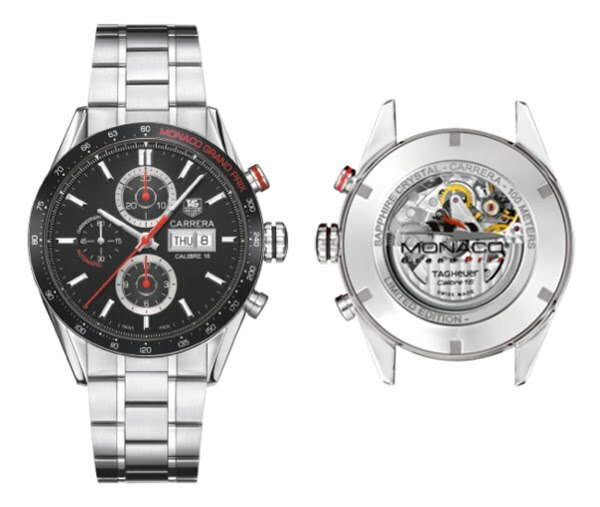 TAG Heuer ambassadors who have crossed the checkered flag first at Monaco include Niki Lauda, Jody Scheckter, Alain Prost, Ayrton Senna, Mika Häkkinen, David Coulthard, Kimi Räikkönen, Fernando Alonso, Jenson Button and Lewis Hamilton. And on the wrists of every one of these driving legends, another legend – a TAG Heuer watch. TAG Heuer’s first Grand Prix Ambassador was the Swiss driver Jo Siffert, whose maiden F1 voyage was the Monaco Grand Prix in 1962. The Swiss driver, a close friend of Jack Heuer and the first F1 driver to sign an endorsement deal with a watch brand, was the go-to man for another TAG Heuer icon, the American actor and driver Steve McQueen. When McQueen starred behind the wheel of Porsche 917K in the 1970 film “Le Mans”, he drove Jo Siffert’s car and wore his complete driving suit, with a red “Chronograph Heuer” crest on his chest and a blue Heuer Monaco chronograph on his wrist. Before the shoot, Jack Heuer had a case of Heuer watches sent to McQueen to choose from. The actor took one look at the unusual square shape and colors of the Monaco — nothing short of radical for the time — and made his choice. Watch and racing fans have been making the same one ever since. 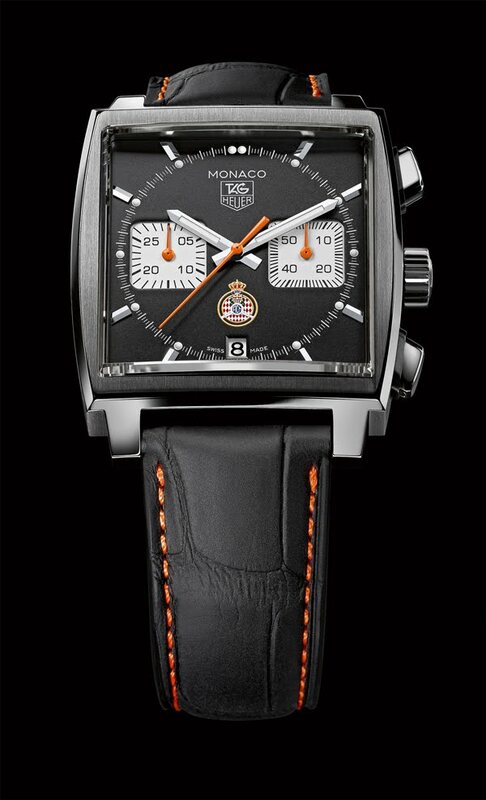 A limited edition Monaco of 1,200 pieces honoring TAG Heuer’s ongoing partnership with the Automobile Club de Monaco. Founded in 1890, ACM is one of the world’s oldest and most prestigious motoring clubs and the organizer of the Grand Prix de Monaco F1 and the equally glamorous Rallye de Monte Carlo. This luxury-level tribute watch has silver sub-counters with exquisite scratch-brushed finishing and a black “soft touch” alligator strap with orange stitching. The MONACO and TAG Heuer logo appear at 12 o’clock, balanced by the iconic ACM crest at 6. The orange sub-counter and second hands complete the authentic motor-racing allure. A glamorous redesign faithfully based on the watch McQueen chose for “Le Mans” — one of the most sought after pieces on the international vintage market. The first watch with a waterproof square case, the first automatic self-winding chronograph, the blue dialed “McQueen Monaco” completely broke with tradition inside and out. The new Monaco Heuer Calibre 11 Chronograph is perfectly in line with the series’ iconic heritage. Standout features include a dark blue perforated leather strap, a stylish blue dial with vertical white stripes inspired by the stripes on Steve McQueen’s racing suit, red hands, the HEUER logo at 12, and the famous crown at 9 o’clock. A super-charged and super-tough reinterpretation of the square-faced Monaco first seen on Steve McQueen’s wrist. 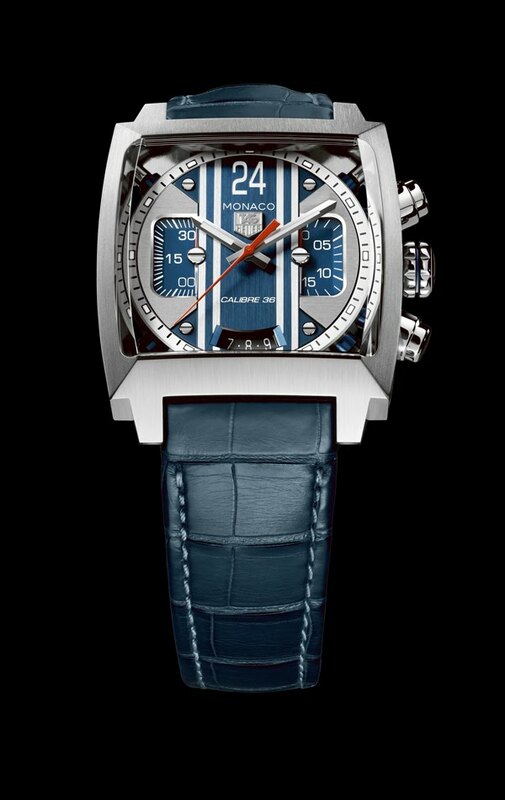 The blue dial is a combination of the traditional McQueen template with racing suit white stripes. The award-winning construction, tubular design and extreme shock-protected components are directly inspired by F1 racecar technology. The manifold arms, visible through the crystal caseback, collect vibrations and direct them away from the movement and into the composite filter, which absorbs and dissipates their energy. This is a chronograph is for ultimate precision, with unmatchable Steve McQueen-vintage flair. 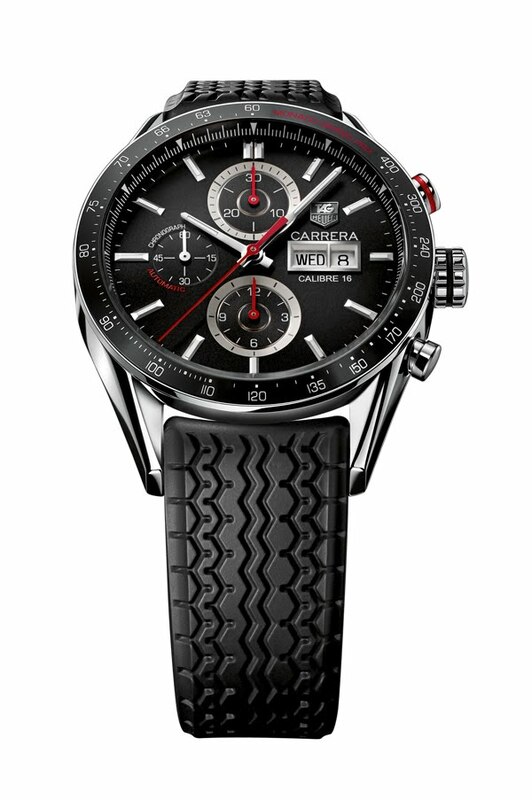 Based on the 1964 Jack Heuer tribute to the grueling Carrera Panamericana Mexico road race of the 50’s, his 3,000 numbered and engraved limited edition CARRERA has Monaco Grand Prix red lettering on the bezel and tachymetre scale, a vintage F1 rubber tire strap, inspired by Carrera Panamericana car, red touch on the hands and pusher, a large 43mm case, and a Monaco Grand Prix logo on its scratch-resistant sapphire caseback. It pays Carrera-inspired homage to Monaco — modern motor sports’ most exciting, prestigious, dangerous and glamorous race.